Abdul WAHAB tum proPakistani ka meera ho………………..
btw guys, if you visit this “Sana”‘s profile, you would observe that she joined on Aug, 8 and is just commenting on Abdul Wahab’s posts. Mujhe tho ye Mr. Abdul Wahab ka hi koi fake account lag raha hy. Pardon me, if my assumption is wrong. Lolz! English to Roman to Urdu Kaise Likhe ??? Mere Pas to Instal hai ? That’s what I was waiting for..!!! Now the best keyboard is GBoard…!!!! We Pakistani and ProPakistanis should know to write Urdu (in Urdu script rather than roman) very well without using roman version. I am unable to do it. I have Google Pixel with default GBoard installed. It just showing urdu language not urdu(abc). Have you used this feature? Please do verify before posting. Mine is updated. If you have tested yourself then comment please. I have Nexus 5X. GBoard comes preinstalled. It is working. Same here brother. Honor 6x. I did this. Its works fine. Gboard, a keyboard app from Google has been the fault input app on most Android smartphones. I am already doing this from last 5 years using google Translate. Can Someone Guide me how it will work on iPhone as its working fine on Android but unable to find Urdu conversion option in iphone Version ??? I don’t think Urdu is available at all in Gboard for iOS yet. This article only applies to Android users for now. There’s a huge difference between being a ‘default’ input app or ‘fault’ input app. A great tutorial on “how to change system language”. Stupid turds. SwiftKey keyboard ? will always be the best. #propk what is the meaning of FAULT??? 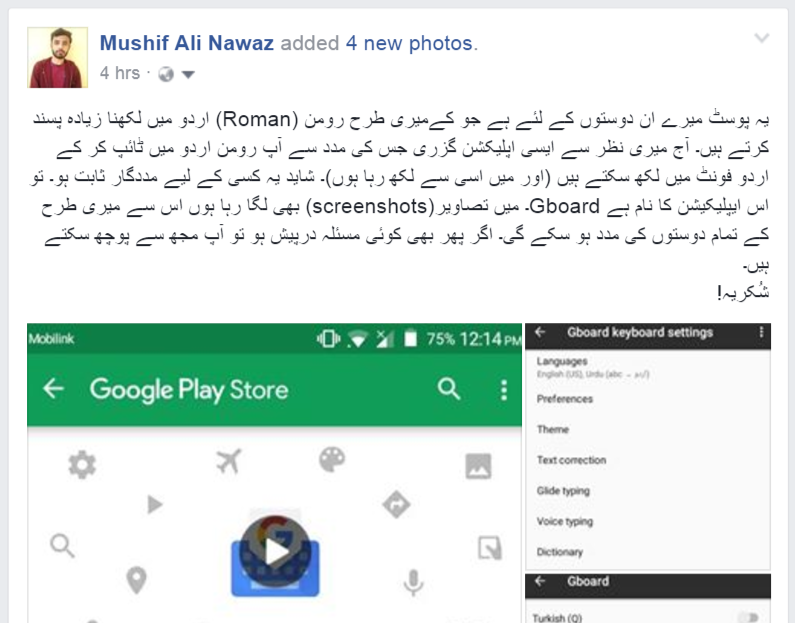 I cannot find Urdu, let alone Urdu(abc) in Gboard list of languages on Android. I think it’s only available in Pakistan. is urdu support available for iphone also?